Just one of the many ‘pluses’ clients can request from Protection Dogs Plus is trick training! Why would I want my personal protection dog to know tricks? Our personal protection dogs are one of the best layers of security you can rely on. They have the ability to detect and defuse a dangerous situation before it escalates. We’re realistic about the fact that 99% of the time, the dogs we offer for sale will be working as trusty sidekicks and not baring their teeth at bad guys. Our priority is making sure that should the day ever come when you are in a dangerous situation, that you have a trained bodyguard at your side at every possible moment. How do we do that? By making it a daily joy to have a personal protection dog! The cornerstone of that effort is our advanced off-leash obedience training, powered by First Choice Canine’s proven obedience training system. Once your dog is walking by your side and hanging off your every word, you won’t think twice about bringing your dog with you on trips into town, vacations, or anywhere else you might be. Tricks are the cherry on top: trick training is a great opportunity for your family to have fun bonding time with your dog while reinforcing his or her obedience. If someone is intimidated by the sight of a well built German Shepherd or Belgian Malinois protection dog and you don’t want them to be—in the case of a nervous friend, for example—you can help set their mind at ease by running through a trick routine. This will illustrate that your personal protection dog is highly trained and good natured, not something that any honest person needs to fear. What kind of tricks are possible? 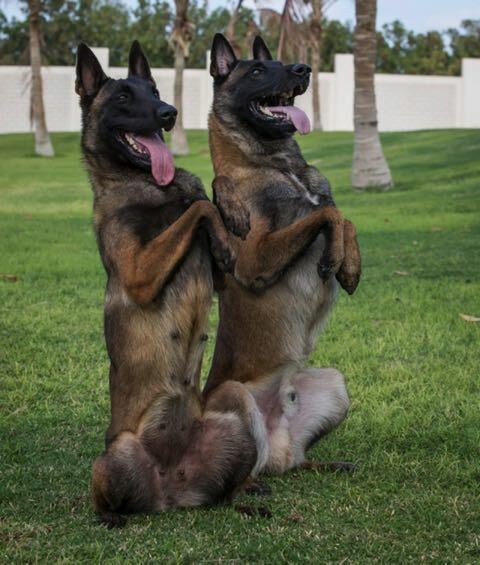 Recently, we delivered protection dogs to the United Arab Emirates (UAE), including a pair of Belgian Malinois who can be seen here showing off at their new home outside of Dubai (Abu Dhabi). Which of your protection dogs for sale know tricks? Trick training depends completely on the natural ability of the dog, and keep in mind we’re talking about a completely different skill set than personal protection. Just as you wouldn’t expect every Secret Service agent to be able to play classical guitar, don’t expect that each dog is capable of the same tricks. If you see a dog that interests you and want to know where he or she stands with trick training, send us a message today. You can even request special tricks and we’ll let you know if it’s possible or not. Already have one of our trained protection dogs and want to add some tricks to his or her arsenal? Get in touch with us about additional training.